We have a number of group treks that depart Chiang Mai frequently. The duration of most of the treks is usually from 1-4 days. Each trek will be led by a licensed English speaking guide who will be accompanied by one or two porters. Our treks are operated according to Tourism Authority of Thailand regulations and guidelines, all of our guides are fully licensed and qualified. Group treks are based on a group size of 6-12 people. 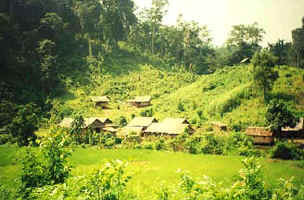 All treks are led by a licensed and qualified guide, who speaks English, Thai and hilltribe languages. If you would like to go trekking as a smaller group, then you can book a private trek. On a private trek, you will not be joined by other people, so eg. if you book as a group of four, you will trek as a group of four. The cost of this kind of trek will be more expensive but it will be your own private trip. 2 Day Mae Taeng trek - 2 days of moderate hiking, elephant riding and rafting on the Mae Taeng River. 3 Day Phrao trek - 3 days of hiking, elephant riding and rafting. The best option if you have time. Day 1 Drive south of Chiang Mai to an elephant camp and ride on the elephants for 1½ hours. Continue driving on to a Karen village, stopping for lunch on the way. From the Karen village walk for 2½ hours, passing two waterfalls on the way. Our final stop is another Karen village, where we spend the night. Day 2 Walk for 1 hour in the morning, passing through a Karen village and then rejoin the truck to drive on to the raft camp. We stop for lunch on the way. In the afternoon raft down the river for 1½ hours. Then drive back to Chiang Mai. If you would like to reserve a place on one of these treks please E mail us or go to our Tour & Trek Reservation Form. Send us your name, E mail address (where we can contact you up to the time you arrive in Chiang Mai), and the trek you are interested in. We will confirm your reservation within 48 hours. If you would like to make an enquiry about the treks or trekking in general, then please use our Enquiry Form, again with contact information and stating clearly what your questions are and what information you need.